Apologies if this is already covered, I am new here and searching on this exact question did not find any answers, nor in RawPedia. Is this a known issue or have I made a mistake somewhere and there is a setting I can adjust to show pictures in order of Date Taken? If you provide a sample file that exhibits the problem (preferably via https://filebin.net/) we can have a look. Over at PIXLS we have a report about missing date information when decoding a Leica DNG. Thank you for raising the issue. The M8 is quite an old camera now and I got mine in 2007. I remember reading in the brochure that Leica and Adobe collaborated on the DNG file. 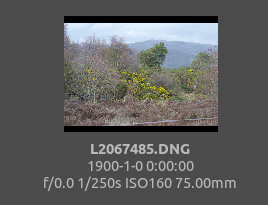 It was never a problem in LightRoom but I don’t want to get drawn into their subscriptions now I couldn’t follow the details on github but I think that date taken and date digitised are the same for practical purposes as the moment I press the shutter. The M8 is quite an old camera now and I got mine in 2007. Sure, but there’s no reason to concentrate only on the newest models. The files are there and you should be able to get decent results with RT from them. So we do our very best to draw you to FLOSS. I couldn’t follow the details on github but I think that date taken and date digitised are the same for practical purposes as the moment I press the shutter. Yes, but I think @Morgan_Hardwood is right and we’ll stick with DateTimeOriginal. Anyway, your problem should be solved in 5.6.